The violent crime rate is low, the economy is strong, ISIS is in decline, and Obama has pulled off miracles, but the Democrats are utterly incompetent at communicating any of this. Trump is running as “The Law and Order President” when there’s nothing close to a crime wave. It’s really sad. LOOK AT THE NUMBERS. From the Urban Crime Reporting Program. The per capita murder rate in 1960 was 0.00005. In 2014 it was 0.00004, meaning it is lower today than even 1960. But you would never know this from listening to Trump. The Democrats appear determined to not get in the way of his distortions. Seriously. 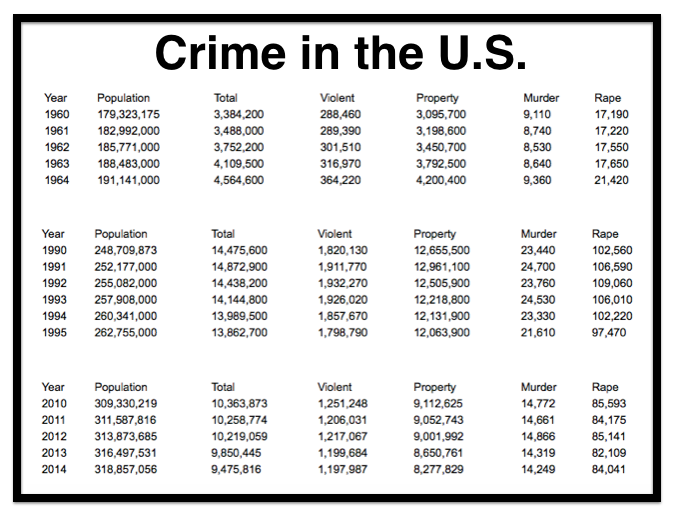 Look at the numbers for violent crime. Everyone knows the murder rate is nearly half today of what it was in the early 1990’s, and it’s even lower than in the idyllic early 1960’s. Trump is billing himself as “The Law and Order President.” It’s so completely wrong. But what is far more wrong is the utter and complete ineptitude of the Democrats to refute this. It’s straight out of McKee’s Triangle. Trump is telling a big “archplot” fear-based story that is just not true. The Democrats are stuck with the real world “miniplot” story of “There is no crime wave.” It is a tough challenge, but not impossible. The solution is to tell a powerful archplot story of Trump’s reasons for lying, but do it in an interesting, compelling way that’s something more than just whining about him being a liar. It’s so sad watching all this. He is a master of narrative as well as performance. The convention had a clear, singular, recurring theme of “Make America Great Again,” for which the word “Great” was easily switched out with “Safe” and “First” and anything else inspiring. What do the Democrats have planned for their theme? If the past year is any guide, they will change their slogan mid-convention. The liberal pundits did their best to label the Republican convention as a disorganized mess. But no, it wasn’t. It had energy, spontaneity and everyone spoke constantly of aspirations. I dread hearing the assessments of the DNC next week. It will be smooth, professional, flawless and … it’s gonna be boring. I guarantee you the most common critique will be “too scripted.” That’s been a problem with previous conventions. This one seems inevitable for that label. It’s a mess. How can this moron be running as the Law and Order President when there isn’t any sort of a crime wave? And how can the Democrats be so inept as to let him get away with it?